Freestone is one of the UK’s most intriguing and creative musicians, exploring the space where jazz, improv, folk music and contemporary classical intersect. 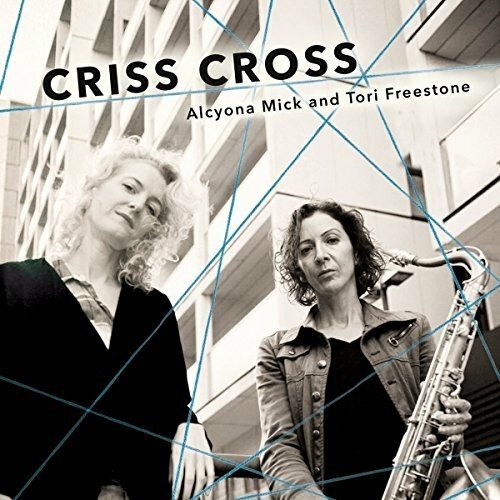 Alcyona Mick has a similarly diverse artistic portfolio that encompasses film scores, her own duo/trio Blink and work with international fusion music star Natacha Atlas. The two have been friends for years and this project has arisen spontaneously out of their shared encounters over the years, finally crystallised in a commission from the Manchester Jazz Festival. The results are as wide-ranging, empathetic and quirkily humorous as you might expect. ‘Hermetica’ introduces a scatted vocal from eminently simpatica collaborator Beraha alongside a tumbling flute melody and tricky 11/8 piano vamp, the whole combining to recall Return To Forever’s early 70 origins. Elsewhere the spirit of Monk hovers as a presiding deity; echoes can be heard in the florid swagger of Mick’s stride piano on ‘Strange Behaviour’ as well as the classic, eccentrically conceived composition that provides the title track. ‘Mrs PC’ has a bluesy feel to the initial that wouldn’t be out of place on an Eddie Harris record, before spinning off into dense harmonic explorations from the piano as Freestone shows off her comprehensive technique. ‘Goodnight Computer’ is an extended 12-minute piece that moves through a series of sombre moods towards an unresolved climax - Mick’s sureness of touch and awesome control of dynamics create the landscape , and the empathy between her and Freestone is evident every step of the way. ‘Pressgang’ re-presents the folk tune from Freestone’s El Barranco album to poignant effect, and the title track is also revisited, the piano fleshing out the harmony that was only implied on the original chordless trio recording to lush effect. ‘Exchange’ is a closely written piece that highlights both players’ effortless virtuosity over rolling triplets. What might potentially have been a rather dry exercise in chamber jazz is invigorated by the good humour and warmth evident in the relationship between the players.